Rated 5 out of 5 by purpleporpoise from I love this one! Fun game - great graphics, medium difficulty HOG I'm really having fun with this game! I'm a beginner with hidden-object games, but I think I can reasonably say this is of medium difficulty as far as HOGs go. It's not too difficult, but not too easy either. Some of the objects are more difficult than others to find (you can always use a "hint" and it recharges), so there is definitely a level of challenge. However, perhaps not challenging enough for expert HOGgers. I can't really say anything about the length of the game, because I'm not finished yet. The story line is simple, but fun. 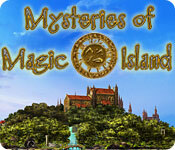 You have to leave Magic Island and make it back to the school in order to become a wizard! I really enjoy games with a medieval or magical theme and this has both. I like that you can actually move some of the hidden objects around to find others - that's the first time I've seen that. Lots of moving back and forth between scenes and the puzzles are fun, not so difficult that you can't solve in a reasonable amount of time to keep game moving ahead at a decent pace. The music and sounds are pleasant, not intrusive and the graphics are very good to excellent IMO. I tried this game as a daily deal through the game club after reading reviews of it in the forum, but it would have been a definite buy for me even at full price. Rated 5 out of 5 by asiaball from enjoy hidden object games enjoyed this game very much found some things hard to deside what to do next but by looking arround was able to find the next step. items were not very easy but not as hard as somethings. great visual and sound. fun to find a way off the island. Rated 3 out of 5 by pmods from Better for Beginners or children This review is based on the full game. Although I did enjoy the game, I gave it 3 stars based on -the length, which was quite short, I played through very quickly. -the navigation system, which I didn't like, often I had to hunt for a way to leave a scene, which I cant stand in a game. -the level of tedium, there was a lot of back and forth, and pointless (in my opinion) tasks, for example having to light 4 lamps in a row in the same way. -the difficulty, which I felt was unbalanced. Some puzzles/tasks were hard while some were simple. Good points were the journal which I liked, and the game was bright, upbeat, colourful and overall, enjoyable. As I said in my title, I think this would be a really good game for younger players, beginners or someone looking for not too much of a challenge. Rated 3 out of 5 by emeraldorchid from Cute game If you like magic, making potions and have a love of HOGs then this is a nice little game. Its very simple, thus giving you a relaxing atmosphere and not very much challenge to minigames. So it's not a buy if you want mindrending minigames. Storyline very linear, but its all about the magic anyway. Like i said, its cute, nothing special. Rated 3 out of 5 by BlueOctober from Could have been better I enjoyed the story - I'm an apprentice that is sent to the island and has to learn enough magic and spells to find my way back. I'm a sucker for a good magic story. I even enjoyed the mini-games/puzzles. What I didn't like was the confusion that was created several times throughout the game when you're not told to do something until after you've already done it....or when you're tasked with creating an "oil potion" and the name on the recipe you're given is "fire potion". Is that the same thing? Turns out it was, but how confusing! Looks like a good concept that was rushed to completion. A good time waster, though. Rated 3 out of 5 by kivancmuslu from Add one more star if you love HOG Okay first of all story: we are playing an apprentice who wants to get into the school of magic. To do this, we need to pass through a test. 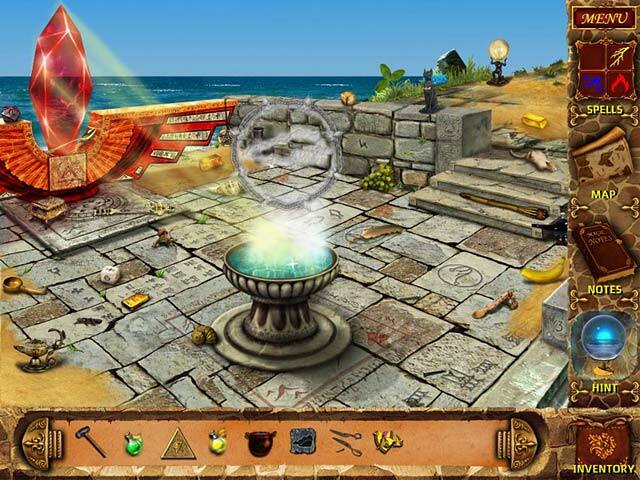 During this time, we are forced to solve some hidden object games, some minor puzzle and mini-games and we learn 4 different kind of magic: fire, lightning, water and air. Game play: About 4 hours including 1-hour trial. 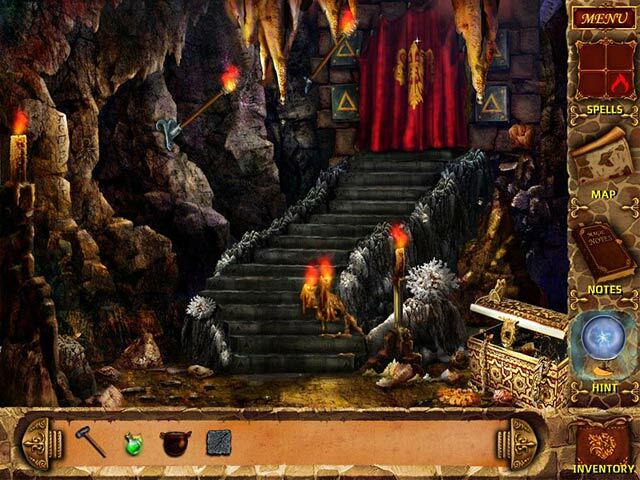 Pros: - Okay game in general, might be good if you like hidden object games. 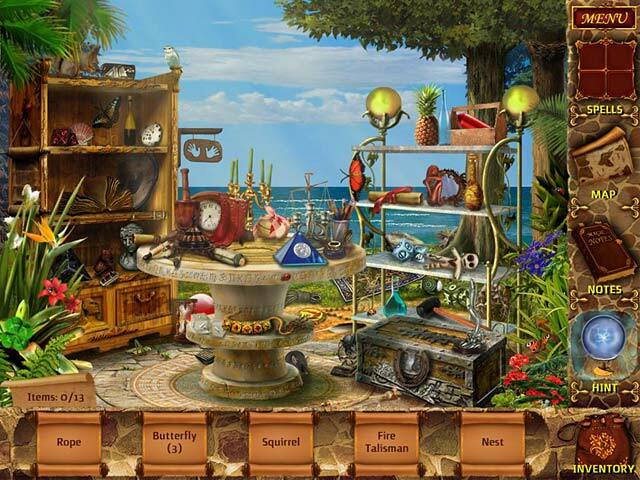 - The scenes and story really merges with the game and objects that are searched for. - Adding of spell-like structures is always welcome. Cons: - The usage (and need) for spells is very limited. - No real voice in the game, just text (this is a big turn down for me) - Most of the mini games and puzzles are either a little weird, or very simple. Verdict: I bought the game while it was 2.99. I would suggest it for the same price, but probably not for the full price. Rated 3 out of 5 by MEnr56 from WOULD HAVE BEEN MUCH MORE ENJOYABLE IF... While the graphics are fantastic and the hidden objects not THAT hard to find, the instructions for the mini-games (particularly towards the end) are SLIM to almost virtually nil which made the game playing more of a task to finish rather than a continued joy to play. The hint button in each area would let you know if there's anything more to do or to return to do but again, towards the end the hint button ALMOST became totally useless except in the hidden object scenes. This game would have been much more enjoyable if the mini-game instructions had been just as clearly explained in the journal as they are in the walkthrough as well as the hint button continuing to point out actions needed in all the areas throughout the game rather than just the beginning up to the middle of the gameplay. I was also disappointed in that the map can not be used to travel to different locations and so there's alot of back pedalling and then return using the "long way" around. A game player also has to be careful in using the earth symbols (particularly the wind) as other inventory objects will NOT work properly until a former action is COMPLETELY done. BTW, the game developers must enjoy the actor, Tom Selleck's TV movie series: Jesse Stone -- as that was the soundtrack throughout this game. Rated 3 out of 5 by CobaltCat from Nice time waster Nice as far as logic goes, but the images are small and hard to see sometimes. Not a bad time waster. Rated 2 out of 5 by AaronzDad from Blah and slightly annoying For me any game is all about the story line. There has to be a reason you're looking for that magic prune or digging up the yard behind the church. This game has quite nearly NO story at all. You're on an island trying to get back home? That's it? OooooK. I strongly dislike HOGs that won't give you the complete list of items you're looking for right from the start. In this game you get five or six things listed at the bottom of the screen and as you find those items the listing is replaced with the next thing you're supposed to look for. This is like going round and round through the drive-thru ordering one thing at a time. "I'd like a bacon double cheeseburger"... "Now I want some fries".... "This time I'll get an orange drink"... After playing for only a few minutes I realized I really just didn't care about anything in this game. Rated 2 out of 5 by sueandjack from Not all that magical of an Island An OK HOG. Not real easy but doable. The puzzles were not as good and near the end it became very frustrating to me. This game is not in my top 100. Rated 1 out of 5 by Scarlitlake from I didn't like this game at all I tried to like it since it got such great reviews but I couldn't even finish it. It just irritated me. I didn't like the artwork and couldn't see the hidden objects well. There wasn't enough storyline for me.